As 2005 draws to an end, I would like to share my impressions on our achievements, notable events, and the plans for the future. From the perspective of U.S.-Armenian relations, 2005 was an active year as both nations continued to enhance the political, military, security, economic, and cultural ties that bring us together. Throughout the year, our mission has been to further enhance the already high level of cooperation and partnership with the United States and also to meet the global challenges facing both our nations and the international community in the twenty-first century. U.S. continuous commitment to helping Armenia’s vision of building a democratic, prosperous, and stable nation was reinforced in December 2005, when the Millennium Challenge Corporation announced its $235 million program to help promote growth, economic development, and poverty reduction in the rural regions of Armenia. The United States continued providing other economic development assistance to Armenia, and humanitarian assistance to Nagorno Karabakh, in the amount of $75 million and $3 million, respectively. We believe that our partnership with the United States is in the interests of both our nations. We stated our support for the U.S.-led war against terror. The Armenian personnel in Iraq are working with the United States within the coalition framework toward reconstruction and stability in Iraq, and they earned high praise and appreciation from U.S. and coalition partners. And in September 2005, the Armenian people expressed their sympathy to the victims of Hurricane Katrina, and the Government extended humanitarian assistance to the victims’ fund. This year has been constructive in working with the United States and other co-Chairs of the OSCE Minsk Group to promote a peaceful settlement of the Nagorno Karabakh conflict. The efforts will continue early next year, and another summit between the Presidents of Armenia and Azerbaijan may prove to be very important in bringing lasting peace to our region. Armenia works to ensure that any solution to the conflict be based on the fact and the right of self-determination of the people of Nagorno Karabakh. In April 2005, we marked the 90 th anniversary of the Armenian Genocide. Each year, more and more individuals, organizations, and nations join Armenians as they commemorate the first genocide of the 20 th century. The State of Kansas joined 37 U.S. states which had already recognized the Armenian Genocide. Commemoration activities in Armenia and around the world, including a high level Congressional Commemoration in Washington, D.C., and wide-scale community events in New York City and Los Angeles generated unprecedented media coverage of this important subject, including my interviews to CNN International and The Washington Times. The year 2005 was fruitful in terms of government to government contacts. Soon after I arrived in Washington, D.C., I have had the opportunity to pay courtesy visits to President George W. Bush, Secretary of State Condoleezza Rice, and other high Administration officials. Armenia and the United States exchanged many high-level visits in 2005, including visits to Armenia by two U.S. Senators and State of Kansas National Guard and official delegation. 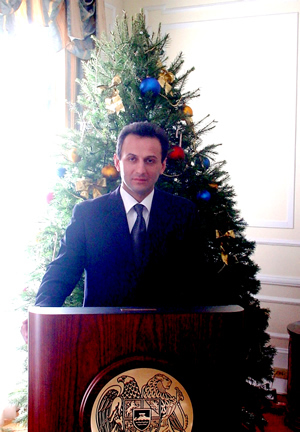 In turn, the Armenian Speaker, and Ministers of Defense, of Foreign Affairs, of Energy, of Finance and Economy, of Agriculture, and, of Trade and Economic Development, as well as other government officials visited the United States and had meetings with their U.S. counterparts such as Speaker Hastert, Secretaries Rumsfeld, Rice, Bodman, Johanns, and National Security Adviser Hadley. These meetings demonstrated once more that there is mutual interest and appreciation for further development of our cooperation. During my visits to Los Angeles, New York, and Detroit, I was greatly impressed by the vitality and strength of the Armenian communities, and their great potential. While U.S.-Armenia bilateral relations are excellent, I want to emphasize the role of the strong Armenian-American community and political organizations in helping us to defend the interests of Armenia and the Armenian people. We appreciate the Congressional initiative on such key issues as recognition of the Armenian Genocide, which passed the House International Relations Committee, and denying funding to the Kars-Akhalkalaki Railroad, a project aimed to undermine the regional cooperation and isolate Armenia. We will continue working together on all issues of national importance. Strengthening Armenia and Artsakh continued to be the focus of Armenian-American community. The Armenia Fund Telethon in November collected more than $7.7 million toward modernization and economic revival of the Martakert region in Artsakh. While the ongoing humanitarian and social programs carried out in Armenia by the Diasporan individuals and organizations will continue to be important, greater commercial involvement by Armenian-Americans will be mutually beneficial for both the Homeland and the Diaspora. In 2005, Armenia experienced another remarkable year, continuing the five-year record of double-digit economic growth and reduction in poverty. The Constitutional amendments passed in November 2005 will strengthen Armenia’s democracy and political institutions, and remove the ban on dual citizenship. With the passage of enabling legislation, this will allow further integration of the Diaspora Armenians in their Homeland’s life. Armenia is home to all Armenians, and every Armenian can make a difference in the Homeland. May 2006 be a year of peace and greater prosperity to our nation and Homeland! On behalf of the Embassy staff and my family, I wish you a very Merry Christmas and a happy and prosperous New Year 2006!